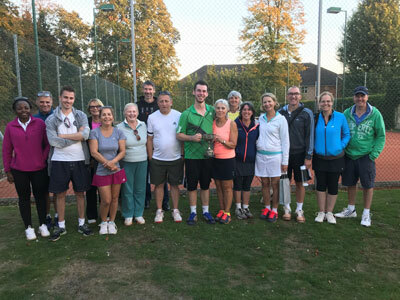 A super sunny Saturday kicked off the Jamison Cup with 20 members participating in our annual social mixed doubles members tournament. 2 groups of 5 pairs played in a round robin format. This was repeated again with the ladies switching male partners, so all ladies played with all 10 men. Congratulations to the winners – Hazel Brownlee and Martin Pringle. After 8 matches, scores on the doors, the top 4 men and top 4 women went onto play for the Champions spot in the knock finals. The only blip was 4th place in the mens draw, as this was jointly taken by 2 players – Phil Langley and Matt Jarman. Their fate was decided on a singles tie-breaker match, which was won by Matt to secure his semi-final place. The semi-finalists included Ryan Romano & Jenny Thrower, Gail Merrison-Stumpp & Mike Saunders, Martin Pringle & Hazel Brownlee and Matt Jarman & Marie-France Weiner. After a timed semi-final, the finalists were Martin & Hazel, and Matt & Marie-France. Again a timed final, 20 minutes later and it was 3 games all. A decider last game was required, with Hazel having to serve into the sun, pressure mounted. After numerous deuces, the winners for the 2018 Trevor Jamison Cup went to Hazel & Martin. Congratulations to the winners, and all the players who made it a very sociable afternoon of tennis.